Today, if there is a tragic case of an animal killing or seriously injuring a human being, it is very likely that the offending animal, whether it was wild or domestic, would be euthanized, or, in other words, executed. However, in the Middle Ages there were many times when the animal would be put on trial before it was punished. We know of at least 85 medieval animal trials that occurred in Europe – many of them in France and Switzerland – and even more cases that would took place in the early modern period up to the beginning of the twentieth-century. Undoubtedly, there were far more medieval animal trials that went unrecorded. Some were criminal trials against an individual animal for harming humans, and ecclesiastical trials against groups of animals for damaging human property. Since then, several historians have examined the topic and have come up with their own ideas on why these animal trials occurred. Some point to the growth of law in during the 12th and 13th centuries – there were now more courts and more lawyers around and they needed work to do. It seems that some lawyers relished the opportunity to defend an animal so they could come up with an ingenious defence. Others point to the Christian notions that God granted man the power to rule over nature, and that these trials were a way of enforcing human authority over the beasts of the Earth. In her work The Beast Within: Animals in the Middle Ages, Joyce Salisbury points to how in the later Middle Ages we see a blurring in the distinction between man and animal. Medieval literature is full of fables and stories where animals behave and act like humans would. We can also see in medieval manuscripts images of birds, dogs, rabbits and other creatures wearing human clothes and taking part in human activities, including war. When one starts seeing animals as almost human, they can soon believe that they have similar levels of rationality and morality that people have. Therefore the animal that attacks a child is seen as responsible for their actions and deserving of punishment. The idea of the animal as human can bee seen in 1386, when in Falaise, France, they convicted another pig of murdering an infant. Before its execution, the beast was dressed in a waistcoat, gloves, pair of drawers and a human mask on her head, and was chained up before it was hanged. The local government paid ten sous and ten deniers to deliver this spectacle, including buying the hangman a new pair of gloves. 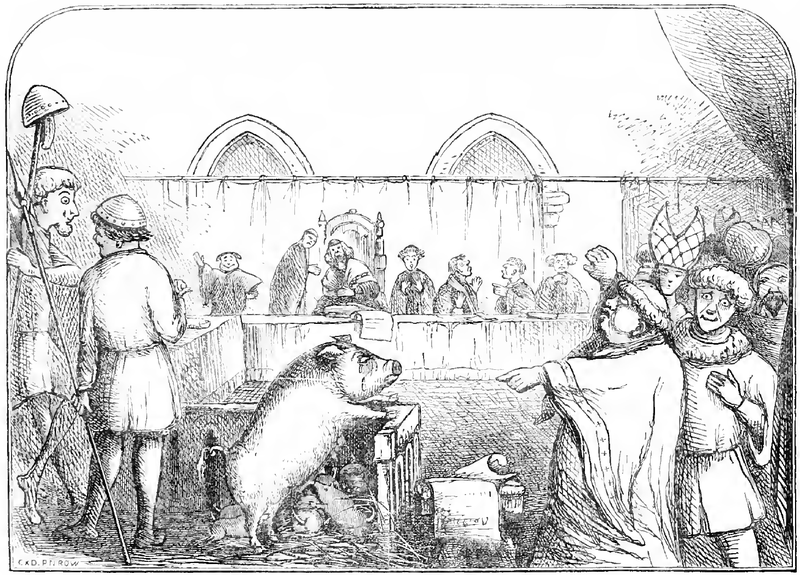 Another type of medieval animal trial took place in ecclesiastical courts, where bishops and other church officials would rule against groups of animals that were damaging human property. These could be mice eating crops or insects attacking a vineyard. Often these trials would lead to a verdict where the churchman would order the animals to be banished from the area – in one case from 1519, the judge order the offending mice to leave commune of Stelvio but noted that the animals had to be granted free and safe conduct, so they would not be harmed by cats and dogs, and that pregnant and infant mice could take as long as fourteen days to vacate the commune. The lawyers who took part in these trials sometimes came up with novel arguments to defend these animals. The sixteenth-century lawyer Bartholomew Chassenee was successful in stopping a trial against rats that ate a field of barley by claiming that his clients could not appear in court because they were afraid of the village’s cats. Other lawyers pointed out that these creatures were created by God and had a role to play in the world, or that they needed to eat the food in order to survive. Perhaps the strangest animal trial we know of took place in the 1730s, in the courtyard of a printing shop in Paris. A young worker named Nicolas Contat explained that he and the other apprentices found life at the printing shop almost unbearable – terrible food, long hours, and having to live in area with dozens of alley cats, whose howls and meowing kept them up at nights. Meanwhile, the printer’s wife kept her own pet cat, her la grise, which got better treatment than the workers. The story adds another explanation to why people put animals on trial and punished them – it was relatively easy to do. In the pre-modern world, it was difficult to apprehend and convict criminals and wrongdoers – it was too easy for them to escape justice. However, the animal could also be the scapegoat – the one who could be caught and subjected to the punishment, for his or her own or for other’s sins.